Call me crazy, but I love to do dishes. (And no, I will not come to your house and do yours!!! HA!) I guess it is because I consider it to be relaxing and helps me to get my mind off other things. Being the busy mom that I am, my brain is constantly in high gear; so anything I can do to help calm me down is a good thing. Even as a teenager I could often be found doing the evening dishes...sometimes even after 10 o'clock, just so I could unwind a bit. The other night, my hubby took the children outside and I stayed in doing the dishes. I really enjoyed that! (And I did go out after I was done too. :) ) . So, you could definitely say that I love to do dishes. As you all have probably noticed, I have been working with Tropical Traditions for awhile now and am really impressed with their products. Recently though, I have discovered their personal care products as well as their numerous household products. I was given another opportunity to do a review with this fabulous company and am very excited about this one!! For those of you who are new to my blog, here is a little bit more about Tropical Traditions...famous for their Extra Virgin Coconut Oil! Before long we had businesses contacting us asking how to order it in bulk. So we discussed how we could mass produce this kind of oil, and almost abandoned the product because we didn’t want to lose the traditional way of making it. In the end, we decided to just keep making it the same way, by having others in our coconut community also make the oil the traditional way. Many of our producers are in areas so remote, that if they did not use their coconuts to produce Virgin Coconut oil for us, no one would buy their coconuts because it would cost too much to transport them to manufacturing plants. In these areas, the coconuts generally just fell to the ground unused until we started training people to make our Virgin Coconut Oil. We were the first ones to export Virgin Coconut Oil from the Philippines to the US market. If you have never tried the Coconut Oil, I would suggest that you do so. It is very rich, flavorful and perfect for cooking. My favorite way to use it is in my pan when making pancakes...it adds a nice flavor to my pancakes and they turn out sooo yummy every time I make them! So, for this review I chose to review the Tropical Traditions Dish Liquid. This product comes in a gallon jug and is concentrated. One of the things I love about this dish liquid is that it is free of dyes, fragrances, petroleum solvents, respiratory and skin irritants. My skin dries out really easily and if I have been doing alot of dishes, you can only imagine what my skin feels like when I am done. I tried out this dish liquid today and it really worked well for me. You have absolutely no scent and the water bubbles nicely. (I like to SEE that my dish soap is working.) It is super easy to rinse off and the dishes are left squeaky clean. If I could change anything about this product, I would love to have some sort of light fragrance. I find that some fragrance is soothing and therapeutic too...especially if I am battling a cold or upper respiratory illness. 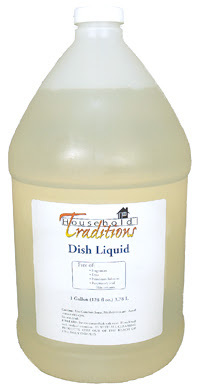 Tropical Traditions Dish Liquid retails for $29.50/gallon...which it normally costs $50.00. So if you are looking to purchase some, now is the time! It's super affordable and it goes a long way. So, in my opinion...this Tropical Traditions Dish Liquid is a pretty amazing product! I love how it works well and contains a coconut oil base. I have some friends that are chemical sensitive and this would be a great product for them as well. I would definitely recommend this product to all of my readers. Visit Tropical Traditions, then come back here and leave a comment letting me know which product you would love to try. :) You do not have to be a blogger to enter, but you must have a valid email where you can be reached should you win. If you do not leave an email address, it must be where I can easily find it. This giveaway is open to US residents and will end 9/27 at 11:59 pm EST. The winner will be chosen using random.org and will be notified by email. The winner will have 48 hours to respond, or another winner will be selected. 1. "Like" Tropical Traditions on Facebook. 2 entries, so 2 comments. 2. Follow Tropical Traditions on Twitter. 2 entries, so 2 comments. Disclaimer: I received no monetary compensation for this post. I did receive free Tropical Traditions Dish Liquid for review purposes. All quotes and stock photos are from the Tropical Traditions website and email. All thoughts and opinions are 100% mine. I would like to try the All Purpose Cleaner. I would love to try the coconut peanut butter. I'd love to try the organic hair oil. I'd love the organic raw honey!! I liked Tropical Traditions on FB! I'd like to try the moisture cream. I would love to try the Organic Moisturizing Lotion in the citrus scent. I'd like to try the Organic Teeth Cleaners. Wow! There's so much to choose from! I'd love to try the All Purpose Cleaner! I would like to try the organic raw honey. I would like to try the Oxygen Bleach. I would like to try the Organic Cocoa Powder. I get a backrub almost every night, so the Organic Massage Oils would be a great thing for me. I would love to try the Coconut Flour. I like Tropical Traditions on Facebook for entry #1. I like Tropical Traditions on Facebook for entry #2. I follow Tropical Traditions on Twitter (@psychotichouse) for entry #1. I follow Tropical Traditions on Twitter (@psychotichouse) for entry #2. I would love to try their virgin coconut oil. I have cooked with coconut oil before and love the taste. I would love to try the dish-soap as well it can be hard to find the right chemical free dish-soap. Id like to try the Atchara. I like the Powdered Laundry Detergent! I've tried a number of their products and I like them all so far. I'd also like to try their Organic Chocolate!